Ok, I have discovered a simple way. Copy this text and paste into your e-mail. Edit the text. Voila! This may not be for everyone (I work in web development), and it's slow, but if you use Chrome or Chromium you can edit the HTML directly and it works fine. While this is a very old query, I have found a nifty way to work on it, thus posting it as a solution. There is a shortcut Alt+Shift+5 to toggle the strike-through. Select the text to strike through, click once Alt+Shift+5 the text is stroked, click once more the text is back to normal. Personally, I type emails that need more formatting options in the CKeditor demo. Then, I copy the final text into Gmail - the formatting is retained. There is no native way to do it, so you either do it in Word (or any other text editor that supports it) and then copy/paste the text in the compose window or you install a browser add-on. 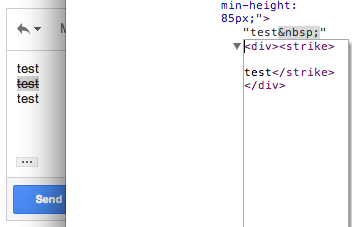 On Mac in Google Chrome, select the text, and hit Cmd-Shift-x. This extension works in Firefox!!! To get to the console, you can right click anywhere in the HTML document of the Chrome Browser and choose "Inspect Element," or you can press "option / command / J" at the same time on a Mac machine. F12 or "control - shift - J" opens up the console on PCs. Once you've done this, the console will remember your command, and you can press the up arrow to cycle through past console commands. When you return to this particular one, just press enter again to apply it. Command (or Ctrl) + Shift + X.
from New Gmail compose formatting and download options in the official G Suite Updates blog. Not the answer you're looking for? Browse other questions tagged gmail text-formatting or ask your own question. Is there a way to prevent Gmail from quoting entire replies? How to alter text orientation to vertical in Google Sheets?